History (originally The History Channel, from 1995 to 2008) is an American basic cable and satellite television channel that is owned by A+E Networks, a joint venture between the Hearst Corporation and the Disney?ABC Television Group division of The Walt Disney Company. It originally broadcast documentary programs and historical fiction series. However, since 2008, it has mostly broadcast a variety of reality television series such as Pawn Stars, Ax Men, and other non-history related content. Additionally, the network is frequently criticized by scientists, historians, and skeptics for broadcasting pseudo-documentaries, unsubstantiated and sensational investigative programming, such as Ancient Aliens, UFO Hunters, Brad Meltzer´s Decoded and the Nostradamus Effect. As of February 2015, approximately 96,149,000 American households (82.6% of households with television) receive History. 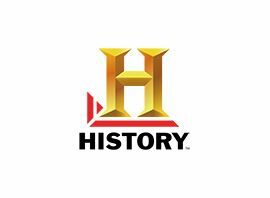 History was launched on January 1, 1995 as The History Channel, its original format focused entirely on historical series and specials. The channel has consistently produced decent prime-time ratings in the U.S.
History´s logo, used from February 16, 2008 to June 1, 2015; the new logo does not have the triangle on the side of the H.
On February 16, 2008, a new logo was launched on the U.S. network as part of a major rebranding effort. While the trademark "H" was kept, the triangle shape on the left acts as a play button for animation and flyouts during commercials and shows. On March 20, 2008, as part of that same rebranding effort, The History Channel dropped "The" and "Channel" from its name to become simply "History." The History channel has a sister channel, H2. H2 has the same ownership as the History channel and runs the same types of programs. On June 1, 2015, the History logo was slightly updated, completely removing the triangle shape on the left. Programming on History has covered a wide range of historical periods and topics, while similar themed topics are often organized into themed weeks or daily marathons. Subjects include warfare, inventions, aviation, mechanical and civil engineering, technology, mythical creatures, monsters, UFO, conspiracy theories, aliens, religious beliefs, disaster scenarios, apocalyptic "after man" scenarios, doomsday, and 2012 superstitions. Programming also includes mainstream reality television-style shows involving truck drivers, alligator hunters, pawn stores, antique and collectible "pickers", car restorers, and others. Occasionally some programs compare contemporary culture and technology with that of the past. On March 3, 2013, History channel premiered its first original series, Vikings.